Playful, subtly sophisticated illustrations speak of this sturdy canvas market tote's inner life. If your tote could talk, what would it say? This one says, "I am your servant, holding your onions, books, and gym clothes. So when it's time to rest, please serve me the best." 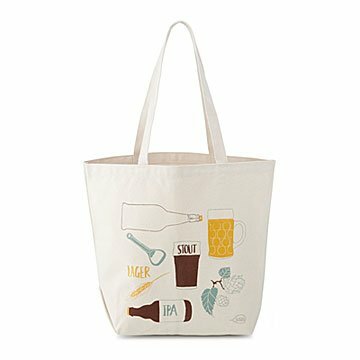 Its playful, subtly sophisticated illustrations of traditional beers and ingredients—a glass of stout, a bottle of IPA, hops flowers, and an ear of wheat—are drawn by hand on 100% cotton canvas. Market-sized, it'll hold your entire farm stand haul. Sturdy handle straps and a flat bottom make it easy to carry, and non-tippy when you set it down to chat with the farmers—or the brewmaster. Claudia Pearson has been illustrating her entire life. Her work has been published internationally in magazines such as The New Yorker, The New York Times, Elle, and Travel & Leisure. In 2008, Claudia published her first children's book, Tribal Alphabet. It won a Silver Moonbeam Award and The Stuart Brent Award for its contribution to promoting multi-cultural awareness in children's literature. Claudia now brings her 20 years of illustrating to practical yet fun textile products, many of which are inspired by her love of great food. She lives and draws in Brooklyn with her husband and two sons. Visit our blog to tour Claudia's studio.